Two-bedroom apartment with a living/dining room area and fully equipped kitchen. 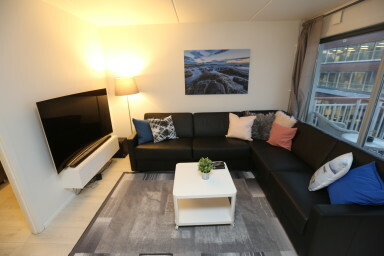 Located on the 5th floor, this apartment has lovely views of the city and Teaterplassen with cafes and restaurants. It has 2 bedrooms with a total of 5 single beds. There is a living room with a sofabed for 2 more guests, and another single bed. There is a flat screen TV and a dining table. The open kitchen is fully equipped with everything you need to make your own meals, including a stove top, oven, fridge with freezer, microwave, toaster, coffee machine and a dishwasher. The bathroom has a shower, hair dryer, iron, a washing machine and dryer. It has a balcony with a small seating area, an elevator and free Wi-Fi. Linens and towels are included but we do not provide food items or shampoo. The Oslo Bus Terminal is a 4 minute walk away and it takes about 8 minutes to walk to the main train station. The subway station, tram and bus stops are a couple of blocks away, as well as cozy cafes, restaurants and the supermarket. Karl Johans gate, Oslo's main street with restaurants and shopping, is a 15 minute walk away. The minimum age to check-in in this apartment when not travelling as part of a family is 24 years old. Please note that it is strictly forbidden to have parties in the apartment. This property will not accommodate bachelorette/bachelor or any kind parties. These apartments are located in residential buildings and a strict minimum noise policy is enforced at the building after 22:00. If you expect to check-in after 10:00 pm, please contact us first, and note that the property charges NOK 250 for late check-ins.